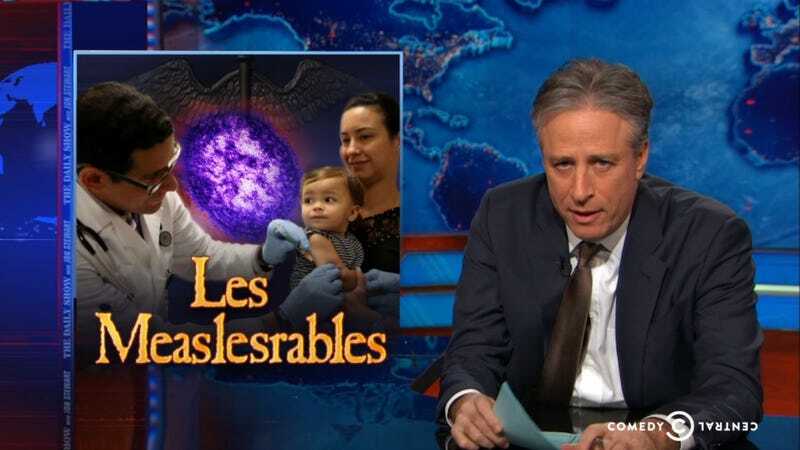 The Daily Show tackled the topic of measles last night (as was pretty much inevitable, sooner or later). Come for the dressing-down of Rand Paul, a.k.a. Dr. Paul: Anecdote Man; stay for the subtle cryo-Walt-Disney joke and CNN's hologram of measles engulfing an empty plane. But first, take a moment to read this thoughtful NPR interview with Tennessee parent Juniper Russo, formerly an anti-vaxxer. It is admittedly stress-relieving to to screech at your TV when smug California hippies start talking about vaccines, but as Phil Plait points out over at Slate, "Most parents who don't vaccinate aren't dumb, and they don't think they're being selfish. They simply love their children, and don't want them to be hurt. This belief is quite mistaken, of course, but it doesn't change the fact that they believe it." So it's helpful to hear from someone who changed her mind. Russo considered herself a "crunchy mom." She admits that, "I thought that she was going to be safe without them and they would unnecessarily introduce chemicals into her body that could hurt her," and she knew people online who blamed their kids' autism on vaccines. So she told her pediatrician no. But the pediatrician kept trying, and gradually Russo's daughter began showing signs of autism, anyway. Finally she said yes, and she plans to vaccinate her son when he's old enough. "I know what it's like to be scared and just want to protect your children, and make the wrong decisions," she says now. If you're going to post an article on Facebook, NPR's is the one you should opt for.